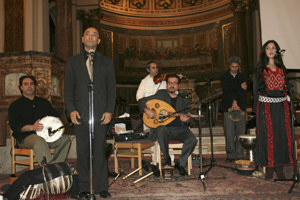 Event: Today’s Youth, Architects of Peace? Lawrence Bloom and Murad Qureshi AM discussed the alternatives facing London as a city and the world as a whole due to climate change. Lawrence Bloom, is the Chair of the United Nations Environment Programme and the former chairman, current Council Member, of the World Economic Forum, Global Agenda Council on Urban Development, Davos. 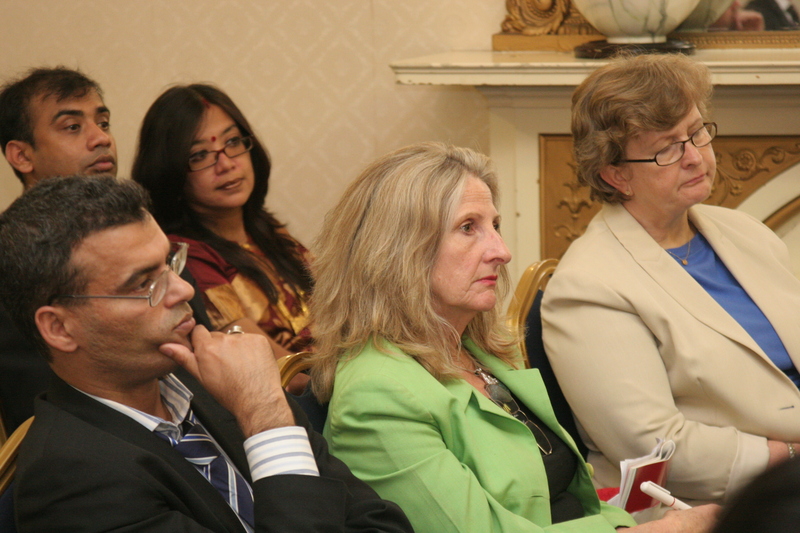 Murad Qureshi AM is the Chair of the Environment Committee of the Greater London Authority’s London Assembly. 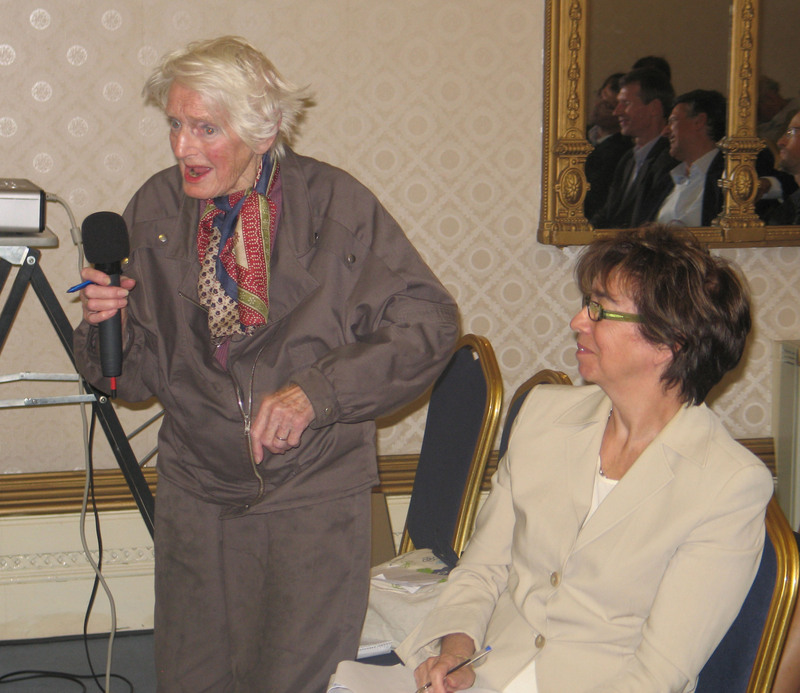 There were a number of notable contributions from the audience including Nicky Gavron AM who, as the former Deputy Mayor, was leading the climate change response on behalf of London during the Ken Livingston Mayoral administration. Murad Qureshi began by emphasising the role of big cities like London in working with environmental issues because 50 % of humanity lives in cities and towns. Nation states will meet in Copenhagen but there is a lot of capacity for cities to collaborate and make their own impetus. He acknowledged Nicky Gavron’s work with the C40 Cities. London made a goal of 60 % reduction from 1990 levels by 2025. There is a localised green economy initiative possible through city level leadership. Transport and housing sectors can be handled locally. He added that a Plan B could be a city level agreement if the Copenhagen Climate Change Summit fails. Lawrence Bloom said, ‘At first the Universal Peace Federation seems a strange convenor for this discussion but when I thought about the crisis facing us I felt this is an ideal venue for climate change discussion. Climate change is a subset of an unsustainable energy system. There is also a lack of sustainability in food, water and the economy. This is not a crisis of climate but of vision based on a lack of values. We in the west find esteem based on buying the newest car and happiness is based on Gross National Product. Correcting the climate will affect all levels. Hence the Universal Peace Federation is an ideal convenor for this discussion.’ (Please see statement below, Reclaiming Tomorrow). For more photos click here. Follow the link for more about Environment Awareness activities. he chilling accuracy of Paul Krugman’s observation was recently confirmed in a Massachusetts Institute of Technology (MIT) review of more than 10 different future scenarios, including those from the Intergovernmental Panel on Climate Change (IPCC) and Royal Dutch Shell. Of those, the MIT study concluded that Shell’s ‘Blueprints’ scenario resulted in the lowest realistically achievable CO2 emissions levels, because it was based on the rapid implementation of advanced technologies and energy efficiency initiatives, and involved a highly effective collaboration between government, industry, international institutions, NGOs and academia. Even then CO2 levels would stabilize at around 650ppm…yet 450ppm is currently accepted as the viable maximum. We now understand that at this level various serious trigger points and feedback loops start operating. Not least of these is the acidification of the oceans, causing them to become a net emitter of CO2 rather than a sink. These increasing CO2 levels then feed back into higher temperatures, accelerating both ice melt at the poles and the melting of tundra ice with its consequent release of methane. So the evidence indicates that we cannot rely on technology alone to ensure our survival. ‘Business as usual’ is not an option – much more needs to be done to raise awareness and change our behaviour. The Blueprints scenario gives us a five-year window. We must act now! Arguably the biggest obstacle to this critical change is the absence of public engagement toward the urgency of our predicament, resulting in a lack of any real commitment to carbon reduction. In line with Einstein’s observation that ‘No problem can be resolved at the same level of thinking that created it’, I believe that only a world-class lifestyle behaviour change programme could take us through this next challenging period with a realistic prospect of minimizing its impacts on human survival and well-being. Each individual will feel that their contribution has value and their drop is helping to ‘fill the bucket’. Galvanizing communities around the world to work for their future in this way creates a dynamic shift, and with it real hope of significant change from our present trajectory. Without such a change, the research demonstrates that technology alone will not save us. The time has come to take our next evolutionary step as a species. This step is to respond to the present crisis by releasing from within ourselves a deeper understanding of our relationship with each other and the planet that gives us life. As a society we are in the process of moving from the adolescent stage of ‘in reaction to’ to the more adult stage of ‘in relationship with’. The economic models of the adolescent stage no longer serve us. In the same way that the skill in a space shot is to know when to blow the explosive bolts, releasing the booster rockets and allowing them to fall away, so we must blow the symbolic bolts connecting us to outmoded thinking. The boosters have a specific function, to enable the craft to escape the earth’s atmosphere and gravitational pull. Our current systems have enabled us to enrich and empower two billion of our species, but they can take us no further. We must now change course from a fiercely competitive win/lose system to a collaborative win/win scenario, where humanity shares all its knowledge of what is and what is not working for the benefit of the whole, at both local and global levels. Each human being, simply by virtue of their human birth, has the right to clean water, nutritious food, proper shelter, access to education, to healthcare, to justice and financial resources. These priorities are only sustainable in a healthy, natural environment, supported by a viable economic system and an environmental Bill of Rights. While these universal values are not prioritised by our present economic system, they appear unattainable. However, once we prioritise them, we can build a new resilience within the current economic model, supporting it by authorising and encouraging the widespread use of community and other complementary currencies. Humanity is the result of five billion years of earth’s evolution. We will discover, within the next five years, whether we are still a viable species. If we cannot engage behaviour change at this scale, we will have failed the ‘intelligence test’ that evolution requires us to answer. The rewards for success are beyond our wildest dreams – but the penalties for failure surpass our worst nightmares. Now is the moment for us to ‘be the change’ we wish to see in the world. Paul Krugman, Professor of Economics and International Affairs at Princeton University, was awarded the 2008 Nobel Memorial Prize in Economic Sciences. 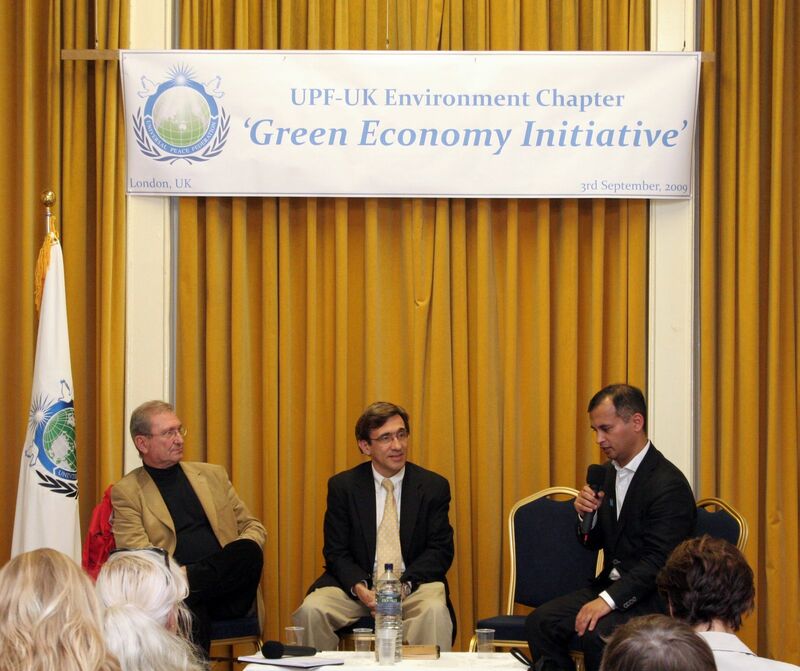 UPF-UK Environment Chapter organized its first environmental conference on 16 July 2009. This is the first in a series of conferences aiming to answer questions, promote discussion and bring awareness to the grass roots through community and interfaith leaders. 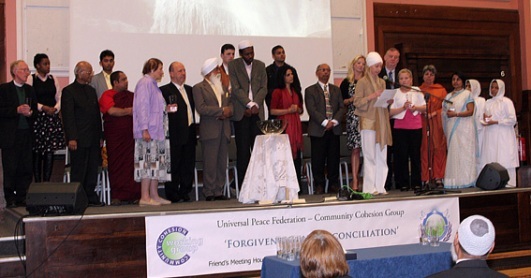 UPF has been active in the area of community cohesion, multi-cultural and interfaith activities for many years. UPF wants to mobilize their network of leaders in understanding environmental, renewable issues in view of the upcoming “Copenhagen 2009 Climate Change Conference” in December. Dr. Yacob Mulugetta, Deputy Director of the Centre for Environment Strategy of Surrey University presented a thorough analysis on issues of food, water and energy crises that humankind is facing today. He concluded his analysis quoting Martin Luther King’s call for change of values. He used the FAO definition for ‘food security’ that exists when all people, at all times, have access to sufficient, safe and nutritious food to meet their dietary needs and food preferences for an active healthy life. World food production must rise by 50% by 2030 to cope with population increases. Currently wheat and corn prices are rising as oil prices and fertilizer rises. There is also a rising demand for high value meat and other products in the developing countries. One kg of meat requires 20.9 square meters of land versus 1.2 square meters for 1 kg of milk and 0.3 square meters for 1 kg of vegetables. Today 1.1 billion people lack access to water. By 2025 more than 3 billion people could be living in water-stress countries – and 14 countries will slip from water stress to water scarcity. We are at the peak of oil supply reserves while we have passed the alarming state where the planet cannot any longer absorb the man-made pollution generated. Dr Mulugetta illustrated how solar energy from the Sahara desert could be used to supply energy for Europe. One slice of bread 40 litres of water. GDP (Gross Domestic Product) has grown steadily in rich countries but people’s happiness and satisfaction doesn’t follow this growth rate. “It took Britain half the resources of this planet to achieve its prosperity. How many planets will India require for development?” Mahatma Gandhi. The economy is a subsystem of the environment. Resources feed the economy and all of the wastes produced by it return to the environment. Since we live on a finite planet with limited resources, it’s not possible for the economy to grow forever. “Making a shift from Vision to Action’’ by Bianca Madison-Vuleta, Complementary Therapist and environmental campaigner. Ms. Bianca Madison-Vuleta’s message was complementary to the analysis given by Dr. Yacob Mulugetta. She emphasized the internal causes of the problem that have resulted in humankind been driven by their materialistic passions. Bianca stressed the importance of changing our lifestyles as a means to resolve the multi-level crises we are facing today. Waste and overconsumption lead to a lifestyle that cannot be sustained any longer because of the scarcity of food, water and energy supplies. Overconsumption has led to obesity and results in unhealthy and unhappy individuals. Vegetarian and balanced diets will both improve people’s health and reduce demand for meat and dairy products that have increased the competition for energy and water resources with other forms of human consumption. Through the discussion it was pointed out that there is a waste of 30%- 40% and over consumption in protein food alone in the west. There is room to compensate in the coming crisis on resources by changing our behavior alone. We have to face problems with a holistic approach. There were good contributions from the audience from Steve Podmore, Founder of Global Sustainability Challenge, Moeen Yaseen, the Managing Director of Global Vision 2000 and Dr Raffaella Bellanca who is a consultant in sustainable energy with Eco. Adapted from www.desertec.org, with thanks. How much solar energy is available for Europe?.The larger red square on the left shows an area of 114,090 km2 from the Sahara desert (about 338 km × 338 km) that, if covered with concentrating solar power plants, would provide as much electricity as the world is now using. The ‘EU’ square (19,200 km2or about 139 × 139 km), is the second red square, shows a corresponding area for the European Union (when it included 25 countries). Lord King, a Patron of the Universal Peace Federation (UPF) – UK, warmly welcomed the conference to the Houses of Parliament. He acknowledged that there were two sections, the perception of faith groups and the analysis of the economic crisis by activist organisations. Civil society groups representatives, such as Nick Dearden, the President of Jubilee Debt Campaign, saw this crisis as an opportunity to rethink the fairness of our economic system rather than going back to business as usual after the crisis is over. There is a $3 trillion debt owed by the poorest parts of the world to the richest parts of the world. For every £1 we give in aid, poor nations pay £5 in debt payments. Richard Dowden, the Director of the Royal African Society, said that Africa is a rich continent full of poor people because of bad governance. The West has been complicit in this, although the prime responsibility lies in Africa. International Secretary General of UPF, Dr Thomas Walsh, presented an overview of UPF’s activities. He emphasised the role of character education rooted in the experience of a loving family to build a stable economy within one family of humankind under God. Rev. Dr. Chung Hwan Kwak, the International Co-Chairman of the Universal Peace Federation, reading from a prepared text, emphasised that there are many policies we need to follow to stabilise our economy or care for our environment but these will be best built upon the bedrock of loving families inspired by God. He called for a Global Service Corps of youth that could heal divisions while working to fulfil the Millennium Development Goals. Imam Umer Ahmed Ilyasi, the Secretary General for the All India Imams and Mosques organisation, who represents 500,000 Imams in India, spoke on the failures of the G 20 agreements. Speaking as a representative of the largest democracy in the world, I do not see economic growth reaching to the grassroots level. Imam Ilyasi said he will launch ‘Faith in the 21st Century’ for interfaith action to solve common problems, later this year. Frank Kantor, the Secretary for Church and Society for the United Reform Church, saw three significant roles for faith communities during this crisis: Firstly, a Prophetic role to present God’s view as we understand it to the world; Secondly, a Pastoral role to care for those who are suffering due to lack of money and jobs; and thirdly, to form partnerships with civil society. Anil Bhanot, the General Secretary of the Hindu Council – UK, stated that there is nothing wrong with money itself but with business ethics. We need a 3-tier regulation system, covering both nation and international transactions, to prevent abuses. Inspired by our faith, armed with the experience of so many civil society groups and an unparalleled network of Ambassadors for Peace and Partner organisations the consensus seemed to be that this is a campaign worth working for and one crucial step towards one family of humanity under God. If there is to be lasting change, the G-20 must acknowledge that the current financial crisis did not happen by accident, and it was not inevitable. The root cause of the problem has as much to do with moral, indeed spiritual failure, as governmental or financial mismanagement. For this reason, improved fiscal, economic and trade policies alone are not enough. The attitudes and behaviour of people, institutions and even entire nations must change. The social sphere that comprises business, trade, and finance is embedded in a wider culture and ethos that, during the best of times in human history, provide the moral and spiritual framework within which we, as human beings, live day to day. Thus, the G-20 must engage in deeper reflection on the moral and spiritual infrastructure that forms the foundation of life in the world. We take an enormous risk when we either ignore or de-value that reality. Ethical Reform: In addition to consideration of critical factors such as energy, security and climate change, food security, the rule of law, and the fight against terrorism, poverty and disease, an even greater need is for ethical reform. This call for ethical reform should be accompanied by greater transparency and fairness whether in financial markets, trade or ‘tax havens’ or in standards of good governance both in developing and developed nations. The Importance of Social Institutions: Wealth, prosperity and human security are dependent not only on the proper functioning of governments, banks and markets, but also the proper functioning of families, communities, schools, and faith-based institutions, where character is shaped and our core values are learned. Sustainable Growth: We call on the G-20 to promote sustainable growth for developed and developing nations. Marriage and Family: Strong, stable, loving families are profoundly relevant to the quality of economic life. The G-20 should give consideration to the relevance of family life to wider economic realities. Character Education: Character education, not only in the family or faith-based institution, but also in our schools, will help assure a thriving moral culture that is necessary for a robust and stable economy. Hard work, thrift, honesty, responsibility, empathy are moral virtues that are essential to a good business and a good economy. Unselfishness: At the heart of many of the world’s greatest religious and moral worldviews is an emphasis on the universal value of unselfishness, and the control of self-centeredness. While traditionally, free markets are guided by a profit incentive, that human inclination must be balanced by higher principles such as altruism and service to others. We call upon the G-20 nations to dedicate 0.7% of Gross National Income at least by 2013 (agreed upon by developed nations in 1970 by UN General Assembly Resolution and reaffirmed on several occasions since) to support overseas development assistance and the fulfillment of the Millennium Development Goals. We would encourage developed nations to forgive debts of the poorest nations of the world especially those accumulated by despotic regimes and that are now shackling succeeding democracies. This altruism demonstrates ‘living for the sake of others’ within the human family. We are All Members of One Human Family: Humanity is one universal family. Despite the diversity of race, nationality, ethnicity and religion, we are all human and we all derive from a common source or origin, known by many as God, Allah, Jehovah, Brahman, the ultimate reality. We call for increased emphasis upon interfaith and intercultural dialogue between and beyond the nations of the G20 to promote understanding of our common root. Let us never forget that we are one family under God.